With Nigeria currently accounting for 30 per cent of new HIV infections among infants in sub-Sahara Africa, President Goodluck Jonathan will today launch a National Action Plan to end Mother to Child Transmission (MTCT) of HIV in the country, a strategic move to ensure the country does not fail in efforts to end HIV/AIDS infection. and others watch during the event in Ikeja, recently. The NACA boss explained that “this high level process undertaken by Mr. President aims at political and social mobilisation to end the AIDS epidemic among children. “It will start with the launching of a National Action Plan to end Mother to Child Transmission of HIV in Nigeria between 2015 and 2016 and progress into a vigorous one-week long nationwide campaign of HIV counselling and testing (HCT) for pregnant women,” he said. 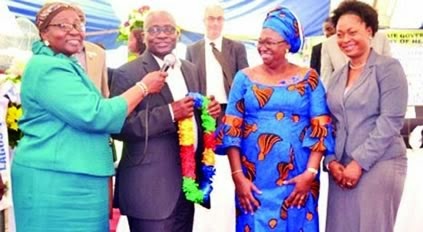 Idoko stated that Nigeria has made tremendous progress in the fight against the virus, stressing that treatment for prevention of mother to child transmission rose from 33, 891 in 2010 to 57,871 in 2013. Also speaking at the media interaction, the United Nations AIDS (UNAIDS) Country Director, Dr. Bilali Camara, said Nigeria needs to expand the current scope in the treatment and prevention of mother to child transmission of HIV in the country. Camara stated that given government, resolve to stem MTCT, it has become pertinent to “accelerate and capitalise on the progress recorded for better results.” Meanwhile, the National Coordinator of Association of Women Living with HIV/AIDS in Nigeria (ASWHAN), Assumpta Reginald, urged government to expedite action in ensuring meaningful involvement and participation of ASWHAN members” in order to make prevention of mother to child transmission work. Reginald also called for the implementation of the option B+ plan, increase in the provision of Anti-Retroviral drugs (paediatric ARV) among others. The presidential launch of MTCT is coming on the heels of growing fears over foreign donors’ withdrawal of funding support for HIV/AIDS programmes in Nigeria. Also, the launch is seen as a commitment by the federal government to embrace local funding, taking cognizance of termination of donors’ funds. This story was published in Newswatch Times on November 13, 2014.